Life is always a balance between time and money. When we feel pressed for time, it’s easy to spend more money than we realize on fast food and convenience products. There are instances when convenience is worth the price in terms of time and money. Most often we are paying more for less in terms of taste, nutrition and the time savings are not always as great as they appear to be. Frozen rising crust pizzas are a good example. These regularly go on sale for $3.99 and with the price of cheese and toppings it can be hard to beat that cost with homemade pizza. On a busy night, frozen store-bought pizza can be a definite money and time-saver. It takes just as long to bake one in the oven as it would to wait for take-out. We can make our fast-food and eat it, too. Pre-washed boxes of salad greens ($4.99 and Walmart and Superstore, $2.99 at Costco) are another convenience item that may be worth paying for. They might be slightly more expensive than the equivalent quantity of bulk produce (especially in the summer) but the ease with which you can toss together a salad after a busy day balances that extra cost. Some convenience items are so vastly over-priced that it never makes sense to pay for them. Pre-cut vegetables are a good example. These are often 3 – 5 times the price (or even more!) of the same product bought whole. Not only do pre-cut vegetables cost more, they also lose their nutritional value more quickly and may have additives to prolong shelf- life. Cutting your own carrots, potatoes and broccoli is well-worth the minimal amount of extra time in terms of the money you get to keep in your pocket. If you really want the convenience of pre-cut veggies, your best bet for the budget and nutritional quality is in the frozen food aisle. These vegetables are flash frozen soon after picking, so they maintain much more of their original vitamin content and can match fresh produce in terms of cost for much of the year. Grated cheese is another item you may be paying an unnecessary premium for. It makes much more sense to purchase a block of cheese on sale and grate it yourself. Toss the grated cheese with a tablespoon of cornstarch and keep in the freezer. The cornstarch will keep the cheese from getting clumpy, and it’s ready to use when you need it. There are lots of ways you can start saving money and reducing your reliance on fast food and store-bought convenience foods, but before looking at any suggestions it’s important to realize the most important one: planning ahead. Take some time at the start of the week when you have a clear head and a few minutes to think ahead. Think about what you will prepare for meals that week. Half the battle is avoiding that after school or after work panic of ‘What will I cook tonight?’ or the early morning scramble of getting food and people ready for the day. Your menu doesn’t have to be rigid, but having the items you need on hand for at-home meals will reduce the chances of finding yourself (again) waiting in line at a fast-food restaurant, or in the rush-hour checkout line spending a good chunk of your weekly food budget on fast food or over-priced convenience foods. Here are 9 tips and suggestions to help you stock your cupboards, fridge and freezer with cheaper and healthier alternatives (that can also save you time). Zip the freezer bags shut, or close securely and shake the bags until the ingredients are mixed. Store in freezer. You’ve got four quick and easy main dishes prepared in less than 15 minutes. Take the chicken out the night before you need it and thaw in fridge. Dump the thawed contents into a baking dish and cook in a 350 degree F oven for 30 minutes until the meat is cooked through. Serve with rice or noodles and salad. Homemade Mac and Cheese Ham Bake: How to make Homemade Mac and Cheese– This version of Mac and Cheese is super fast and simple – no need for the over-priced boxed version. The hardest part is cooking the noodles. You can prepare this the night before and leave it in the fridge until you are ready to bake it. You can switch it up by adding a cup of salsa or ham like in this recipe. Biscuit Mix: How to make Biscuit Mix– These are great for breakfast or to accompany an evening meal. You can also use it in recipes that call for store-bought biscuit mix. Refrigerator Bran Muffins : A batch of this muffin batter only takes a few minutes to mix up, then can be kept in the fridge for up to 6 weeks for quick breakfasts and snacks. Instant oatmeal: How to make instant oatmeal– Toss 4 cups oatmeal, ½ teaspoon salt, 1 teaspoon cinnamon, ½ cup brown sugar and 1 cup powdered milk (optional) into bowl of food processor. Pulse for 1-2 minutes until oats are broken up a bit and ingredients are mixed. Add raisins or other dried fruit and store in an airtight container. For each serving, place ½ cup of the instant oatmeal in bowl. Cover with 2/3 cup boiling water. Let sit 2-3 minutes and serve. Brownie Mix: How to make Brownie Mix– Having a few batches of this on hand makes it easy to put together a quick treat or dessert at a moment’s notice. It’s perfect for when you need to bring something to work or school and cheaper than stopping off at Tim’s or the supermarket. Condensed Milk: How to make condensed milk– Condensed milk is used in many quick and easy dessert recipes, but it can be very pricey. It’s easy to make your own at home for a fraction of the cost. Salad Dressing: How to make salad dressing- A simple vinaigrette is cheaper than store-bought, without all the additives. It is infinitely variable, and will keep in the fridge for up to a week. Taco Seasoning: How to make Taco Seasoning– Lots of fast and easy recipes call for taco seasoning. Don’t bother buying it when you can make your own in seconds for a fraction of the cost. Don’t try to make too many changes at once. If you find you are relying heavily on fast foods and convenience foods, set a goal of reducing one or two meals out a week and eliminating one prepackaged food to start. Once you see how easy it can be to DIY, eating more healthily and cheaply, you’ll wonder why you’ve spent time waiting in line for food that isn’t really all that fast or convenient after all. Here are a couple more good reads to get you started making your own fast food at home. 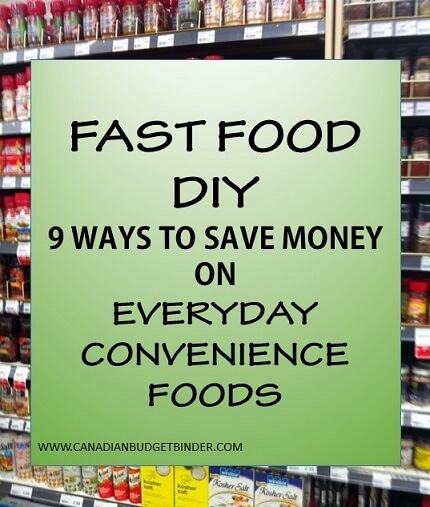 What convenience foods have you made at home instead of buying at the grocery store? This was no-shop week which means we didn’t go into any grocery stores. 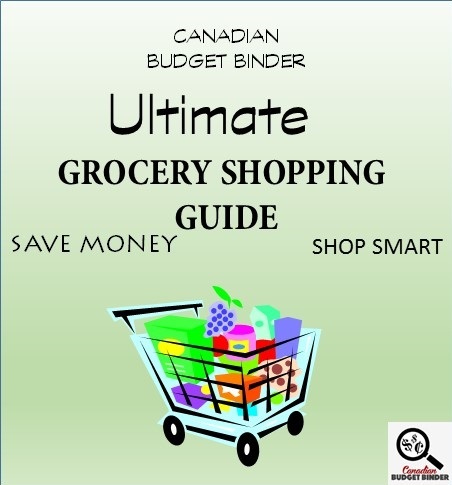 Here are some great places you can find Canadian Coupons! I found a few coupons last week but nothing new for this week so I’ll share the same coupons again for those that missed them last week. We’re finding less and less coupons in the stores these days. What are your thoughts? Are coupon apps taking over the paper coupons? I didn’t find any coupons this week as it was a no-shop week. 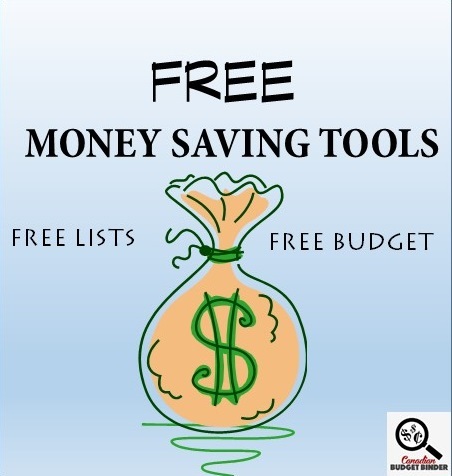 If you like FREE then click this link for my FREE Excel Budget Spreadsheet and all my Free Money Saving Lists. some great deals this week and stocked up on some staples! 2c off a litre for fuel. Sobeys is starting to become more active with their air mile specials which is similar to PC points…..and we are taking advantage of that. We came in just under budget and that bit has been added to the carryover jar. Next month is the Walmart anniversary sale, and that is the time I stock up on toilet paper for the year. I anticipate that will be the time to use what’s left in the jar. We are actually running low on paper products, so this will be a good thing. Yes, it’s an assumption that they will have a good deal on toilet paper at this time, however, they have every year up to this point. I did a lot of shopping at Walmart this week, which I do not normally do. In this case, their unadvertised prices are better for items we needed like glass cleaner, cleaning solution and spices. The two FPCs I used there, that product was unavailable at RCSS and I couldn’t imagine letting free yogurt go to waste. RCSS was typical for just before a trip. We don’t keep as much snack food in the house these days and we needed some non-perishable snacks for our journey to see relatives. To them we brought beans, carrots and tomatoes out of our garden. My mom also brought zucchini, tomatoes and beans. Our contribution to the food situation during our visit since we can’t afford to give them a gift card like they do for us. The chocolate milk to go is for my son for school. They go on great prices before school starts, with making it almost on par for cost. That way he can recycle the container and I don’t have to fight with stinky stale milk smells at the end of the school day. Spices are often cheaper at Walmart. We did alright this month, even though I left the increased budget from 50 to 60 for an additional month. I will do the same next month to accommodate the pantry stock up. I guess you could call it a $10 weekly stockpile budget for three months. The more I have on hand with school starting for my kiddo as well as myself will help tremendously. We have never used the greenworks glass cleaner or the great value before. We are trying great value because of the cost. I have always bought windex up until now, but they are charging so much for it. No verdict on the great value cleaner yet, I’m just finishing up the last drips of windex and don’t want to mix them. As for the Greenworks, we pretty much use that brand for everything else. Dish soap, floor cleaner (smudges a bit, but not as bad as many other brands), bathroom cleaner and the all purpose cleaner. The smell of them doesn’t bother my son with his fragrance allergies, so I don’t deviate from them often. Glass cleaner tends to smell the same brand to brand, doesn’t always clean the same. I did miss one receipt on the list, however it was included in the overall monthly value. It was from IKEA of all places. I don’t get there often and there are a few things we get from time to time, I was in for straws. However, I did find a bag of coffee for 6.00. We haven’t tried it yet, we are on the last few grounds from our Winners purchase of coffee grounds earlier in the summer. I hope it tastes alright, but not too good, we don’t live close enough to IKEA to get there regularly. LOL. My son was feeling left out at school because I stopped ordering milk from the school. I just couldn’t justify the expense any longer. They are charging 1.00 for each milk ordered. Ridiculous for such a little container. I know council isn’t making much off of it, so I don’t feel bad not taking part. I am on the parent council and fundraise for the school and I do my best to support the fundraising as much as I can. In this case, the cost is almost equal to the expense of council. So, if I can find it cheaper in the store to pack for my son, then I have no guilt associated with it. These containers of milk run 50 cents each, half the cost. And, I am reducing the amount of vinegar I am using getting those containers clean and not smelling. I was just trying to picture where you bought coffee at Ikea and now I remember. We hardly ever go there. WOW that is pricey for those tiny containers of milk . You do what works for your family and your budget. I hope your son doesn’t feel left out and realizes it’s just milk. It’s amazing how the small things are big things to the kids. Let me know what you think of the window cleaner. Well, verdict on the window cleaner is that it is alright. It works well on our marble countertop in the bathroom and just takes a bit of extra elbow grease to make sure there are no streaks on mirrors. Haven’t tried the windows yet. I still prefer Windex, but now I know if it isn’t on sale, I can make do with the Walmart Great Value brand. I agree with the elbow grease on the mirrors. It looks great but then every time we go back that darn streak appears again. Thanks for this! I will definitely try this Mac and Cheese Ham Bake. Overview: 1st week – Stocked up on some meat, in addition to what we are getting in a couple of weeks. Trying to add new meals into the mix, which is not easy to try and think what to make that’s cost efficent, we’ll like and easy to make homemade. I want to try and make some freezer meals so that it can be ready for me when I get home from work…just need to find the recipes that I make large quantities and put into the freezer. Overview: 2nd Week – I’ve decided to create a Produce account so that I’ll have money set aside for next year. I want to ramp up my canning since not a lot was completed this year. Due to the large shop last week, didn’t need to get much in the way of groceries. Will be putting away 15 doz cobs of corn into the freezer and that should last us all year but it will be worth it. I’ll have to look further into these recipes later tonight as I’m trying to move more to homemade foods. I’ll have to see how hard and what ingredients are needed as I typically don’t cook with herbs and spices. Maybe if the recipe is one that I’d make over again, I might invest in those ingredients though. A very good article Mary!!! I will need to look much farther once I’m on the laptop tonight so I can save and print things!! I will buy the pre-made cole slaw here for holiday dinners as we don’t eat enough to warrant using the whole cabbage worth.hubby isn’t one for eating his veggies and he thumbs his nose at the ‘leafy crap’, so it’s just the two boys and I eating it usually. Some place in my files I have a recipe for a home made shake and bake recipe you make up and add a couple of tablespoons worth to bread crumbs and use that way. I also have a recipe or two for home made biscuit mix I should dig out. I have made the taco seasoning in the past but usually buy the kits on sale. It’s not something we eat often and I have had salsa develop mold. Hubby has issues with his immune system so I won’t take that risk. I will be looking much deeper into this later…thank you for the information!! We really did not need much this week, as you will see. I had a burning desire for nachos but we were shopping the “LOW SALT” options to create our dish. There’s lots leftover for a 2nd dinner for two and although the dinner was a little pricey, it was still a lot less expensive than it would have been if we’d done take-out. This week we also decided to have two dinners “out” using gift cards we have had for a really long time. One night we’re going to Ricky’s for some nice salads with added protein. Our second outing will be to The Keg so I can enjoy a whole Atlantic lobster, before their lobster special ends on the 30th. OUR NEXT USA SHOP WILL BE in 2016 when I am in better health. OUR TOTAL UNUSED RESERVES ARE $1,443.81 … that is a $937.50 carry-forward from 2013 & 2014 and $506.31 in NEW 2015 savings. We have groceries that have been purchased using points redeemed, rather than the budgeted cash in the amount of $59.67. Available as an offset, we currently have $59.67 in our UNUSED CASH RESERVE. As at this moment, we need and additional $0.00 in the UNUSED CASH RESERVE. If our budget is truly sufficient, when we reach December 31st, the unused funds should still be equal to, if not greater than, the value of the points redeemed. It’ll be interesting to see if they actually are. Note: Another reserve of $315.57 IS AVAILABLE for our next US shop!